According to conference organizers, INCA 2018 intends to "celebrate the growth of the sector, to focus on new developments and opportunities, to welcome continuing government support through funding programmes and to highlight the appetite of investors to support the altnets." Day Two of the conference is billed as the main conference day and will comprise of keynote speeches, panel discussions, plenary sessions and parallel workshop sessions. The day will begin with a keynote speech delivered by Ronan Kelly, President of the FTTH Council Europe and Chief CTO of Adtran, followed by two sessions. 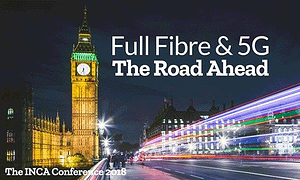 The event is anticipated to "close with a bang" with a concluding head-to-head keynote - entitled 'Incumbent vs Challenger' - which will be co-hosted by Openreach's Clive Selley and CityFibre's Greg Mesch. INCA has been established to support, plan, build and operate sustainable independent and interconnected networks that enhance the social and economic development of the communities they serve. Membership is open to any organization that supports the development of independent digital networks and infrastructure, with members ranging from network owners, operators and managers to public sector groups, middle mile networks and equipment suppliers.